Janice Withycombe walks a cancer patient through using an iPad app to record his symptoms at Children's Healthcare of Atlanta at Egleston. In the battle against cancer, new drugs and therapies make the news. Behind the scenes, pediatric nursing researcher Janice Withycombe PhD MN RN CCRP knows that better care leads to better outcomes for young cancer patients, their families, and clinicians. Upon joining Emory in 2015, Withycombe found a strong mentor in oncology nursing researcher Deborah Bruner PhD RN FAAN and a strong connection with the Children's Healthcare of Atlanta Aflac Cancer Center, one of the largest and best in the country. "Childhood cancer is rarer than adult cancer. In order to do our best work, pediatric oncology researchers have to band together," Withycombe says. Accurate and effective communication is at the heart of her research, which focuses on symptom identification and management in children undergoing cancer treatment and patient/family education for children newly diagnosed with cancer. In the United States, about 15,000 children and adolescents are diagnosed with cancer each year. While most adult cancer patients don't participate in a clinical trial, the majority of children are enrolled because that has become the standard of care. The federal government mandates that adverse events (AE) during any cancer trial be collected and recorded. There are 790 AE terms according to the National Cancer Institute's Common Terminology Criteria. Almost a third of the AE terms have some subjective component, such as pain, fatigue, or depression. Research shows that parents or clinicians most often report a child's symptoms, but their rating doesn't always reflect the child's experience. And they often under-report the burden of cancer and treatment on the patient. "We were missing the child's voice, so our team designed a survey for the iPad that children can use so they can tell us how they're doing," Withycombe says. The Pediatric Patient-Reported Outcomes version of the Common Terminology Criteria for Adverse Events (PRO-CTCAE) includes 130 questions that assess 62 symptoms. Its language is kid-friendly, based on what researchers discerned from talking with 117 children with cancer, from ages 7 to 15, at seven hospitals in the United States and Canada. All of the hospitals are now testing the survey. "When I asked a young patient what she thought of the survey, she said, 'It was easy, because it was all about me.' That's exactly what we were trying to do—make it easy for children to tell us how they are feeling and functioning during therapy," says Withycombe. 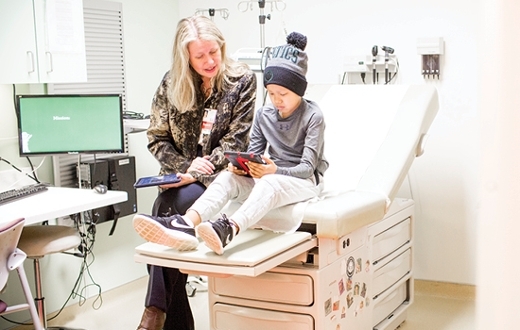 When adopted by more institutions, the pediatric PRO-CTCAE has the potential to increase the accuracy of symptom reporting in clinical trials and improve the care given to young cancer patients.